Over the last few weeks I have posted 2 different reviews about various products from Nature Balance Wellness. You can read the review for the facial collection here and the second review can be found here. This is the third and final installment of this review series. I have been thrilled with the quality of these products and would have no objection to working with these company in the future. They have been a privilege to work with and I really encourage everyone to pay them a visit. 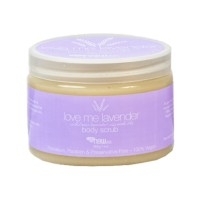 The Love Me Lavender Body Scrub is one of my favorite products hands down. Lavender is amazing for the skin. I use this product nearly every time I shower and a little goes a long way. I especially love to use this product on problem areas on my legs and bikini area. Some areas need a little more love, especially if you are a frequent shaver. Speaking of shaving, I was told that this product also doubles as a shaving oil. Use it first to exfoliate and then wait and you can use the extra moisture to shave. It really does keep the skin terrifically moisturized and give you a close shave without all of the ingrown hairs, but the downfall is that it gunks up the razor quickly. Perhaps I need to adjust the time in between exfoliating and shaving. Immediately after using this product I watch as the water beads right off of my skin. The smell is so calming, I'm in love.